Yesterday I heard "September" by Earth, Wind and Fire on the radio and it dawned on me that 70s music finally has gotten its due. For years it received no respect, but I think radio has finally come around. Radio has always been pretty good at playing so-called "classic rock" music from the 70s. How many times have you heard "More Than a Feeling" by Boston or "Stairway to Heaven" on the radio? - probably in the millions. So, bands like Skynrd, Floyd, Kansas, Zeppelin, Supertramp, Bad Company, and The Eagles have gotten more than their fair share of radio play over the past few decades. Unfortunately, most of the musicians popular in the 70s that couldn't be categorized as classic rock became M.I.A. as early as the 1980s. 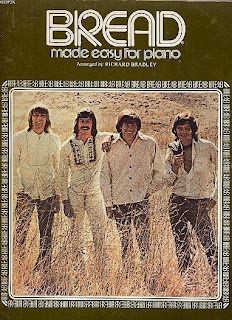 Sure, the oldies or easy/soft format stations might graze the surface with "Summer Breeze" by Seals & Crofts, an Elton John hit, or "Cat's in the Cradle"; but, for the most part, mainstream 70s music went bye-bye. For instance, how many times in the 80s and 90s did you hear hits from Tony Orlando & Dawn, Bread, The O-Jays, Pablo Cruise, or Captain & Tennille? Anything that even resembled disco was verboten - thus, KC & the Sunshine Band, ABBA, and the Bee Gees were a distant memory. Decades passed without "Brandy (You're I Fine Girl)", "Shadow Dancing", "Escape (The Pina Colada Song)", or "Play That Funky Music" ever getting airplay. Okay, certain metropolitan areas could afford to specialize in the 70s - but, as a general rule, radio in most U.S. cities just didn't go there. In the latter half of the 1990s, GenX started to rediscover music from their youth, and there was a shortlived 70s revival (ex. Dazed and Confused and That 70s Show), but it didn't amount to much. GenX has never been a big source of revenue, it's always been the Boomers and now a younger generation with tons of their parent's money that draws the big bucks. So, what gives? Why all the sudden can I turn on the radio from coast to coast (I travel a good bit) and find England Dan & John Ford Coley? How is that guys like The Bellamy Brothers and Andy Gibb are starting to reappear? I don't really know the answer, except to say that maybe the 70s stigma has finally been overcome and, perhaps, this younger generation enjoys 70s oldies every bit as much as the Boomer-beloved 60s music. I actually started noticing this a few years ago, though maybe those songs are being played even more now. 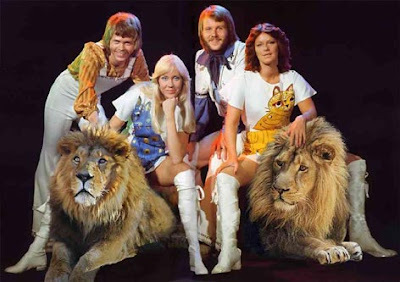 When I heard an "oldies" station play ABBA, I knew the Apocalypse was just around the corner. That oldies station died a few months later. A little ABBA on the radio never hurt anyone. Once they start whipping out "The Nights the Lights Went Out in Georgia" and "Kung Fu Fighting", you probably can kiss that radio station goodbye. I'll be listening... problem is, no one else will. I always liked the blond from ABBA even though she's hippy and not really that hot. 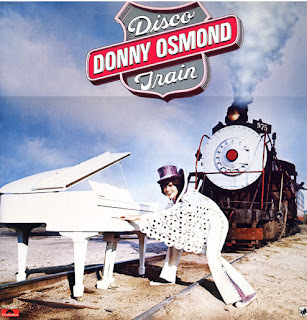 That outfit Donny Osmond is wearing on the album cover is priceless! I'm a child of the 70's and am glad to see the resurgence. I couldn't take anymore Chris Brown, Flo-Rida or any of that other garbage, and I finally got my son to listen to some of MY music. He's been hooked ever since. He was Angus Young for Halloween. Took his guitar and portable amp with him. He'd never seen that much candy before. Thanks for the visit! I'll definitely be back. Zibbs- Agnetha Faltskog is a babe, you can't deny it. Hairball- I found myself wishing that train would hit Donnie. Nukedad- The Angus Young costume sounds great... my child's Bon Scott costume didn't go over quite so well.